No one would argue the fact that Google is one of the most useful sites on the Internet. Unfortunately, most people only use about 3% of its power. 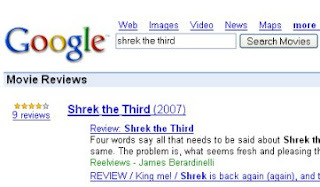 Smart Google users, on the other hand, know how to turn Google into a quick calculator, translate foreign sites, create their own customized search engine, and search for movie reviews and stock quotes with special search queries. In this article, we’ll show you how to do all of that and more. Take Notes while Browsing the Web with Google Notebook. This note taking application allows you to organize all of your online research quickly and easily. With Google Notebook, you can clip text, images, and links from web pages while browsing. Your notes and clips are saved to an online “notebook” that you can access from any computer, and may also be shared with others. So whether you’re planning a vacation or writing a school paper, Google Notebook makes it easy. To get started, go to Google Notebook’s main site. Translate Foreign Sites A large portion of the web sites on the Internet are not in English. This means that you’re missing out on a big portion of the Web. Fortunately, Google has provided a solution. First, translate the word you want to search for into the desired language. You can do this at BabelFish. Next, go to Google, enter your search query, and press enter. On the results page, you should see a link that says, “Translate this page” to the right side of the search results. Click on that link and Google will automatically translate the page to English for you. I have used just this one tip to discover a number of great new sites that I never would have had access to if it weren’t for Google’s translation tools. Google also has lots of specialized search portals catered to technology enthusiasts. Are you a Mac junkie? Google will allow you to search for all things related to Mac and Apple at http://www.google.com/mac. Search for all things Microsoft at http://www.google.com/microsoft. Not a Microsoft fan? Google’s got a special Linux search engine waiting for you at http://www.google.com/linux. Forget the Weather Channel. Who needs television when you’ve got Google? To get your local weather, simply go to www.google.com and type in weather:”areacode”. Fill in your area code and you will be given a 4-day weather forecast and today’s temperature, wind, and humidity. Looking For a Stock Quote? Find it quickly at Google by typing in: “stocks:msft”. This search query will give you a quick snapshot of Microsoft’s stock performance. To find other stock information, just change the stock symbol. Create your own Customized Google Search Engine. Google is allowing everyone to join in the fun with Google Custom Search Engines. This Google product allows anyone to create their very own search engine. You get to choose the sites, invite others to contribute to your search engine, and even customize the look and feel to suit your preferences. You could make your very own customized search for jobs, videos, digital camera reviews, and more. The possibilities are endless. Start building your own search engine at http://google.com/coop/cse/. Hidden Google Pages There are also a number of hidden pages on Google that you’ve probably never seen before. Here are just a few of them: Google Moms - A tribute to Google moms for Mother’s Day. Google Dance 2004 , Google Dance 2005 and Google Dance 2006. Yes, it’s hard to believe, but Google has their very own dance. They’re packed with plenty of food, drinks, games, product demos, and a hotspot where you can meet the engineers. Google Holiday Logos - About the only thing that spices up the Google homepage are their cool logos. They’ve dedicated a special page to commemorate all of the holiday logos dating back to 1999. Dilbert and the Google Logo - Check out the first and last Dilbert cartoon on Google. Get the local time of any place Not many people know that Google can also be used to get the local time of any place. To get the local time of the place of your choice follow the steps mentioned below. 1.) Point your browser to www.google.com 2.) In the search box type time . For e.g. to get the current time of Bangalore type, time Bangalore 3.) The search result has the first entry as the local time of the place you entered.